Heavyweight Double Vinyl on Gatefold Sleeve with etched D-Side. With International Feel, Mark Barrott brought Balearic music—disco-tinged rock, cosmic grooves, tropical funk—into the 21st century. 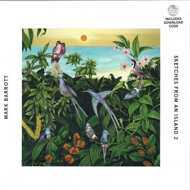 With his solo work, Barrott has homed in on a particularly engaging strain of the sound, one that leans retro. Inspired by the Jose Padilla tapes sold at markets around Ibiza, the laid back guitar solos and wind instruments of the early Sketches From An Island material—compiled into 2014's stellar album of the same name—made for the ideal tropical island soundtrack.